Determining Adjectives are the words that accompany nouns and define meaning while indicating gender and quantity. These little words make a big difference in Spanish language, so complete ability to use these words is necessary. The following lesson plan focuses on the demonstrative adjectives and using them in context. Students will understand and be able to use the demonstrative adjectives. 2. After noting the things in common on their organization sheet, introduce the first type: demonstrative adjectives. Explain that these words describe proximity or distance and are equivalent to this, that, these, and those in English. Fill out the chart on the organization page accordingly, explaining as you fill out the page. 3. Teach students a new jingle for helping them remember the spelling and usage of demonstrative adjectives. 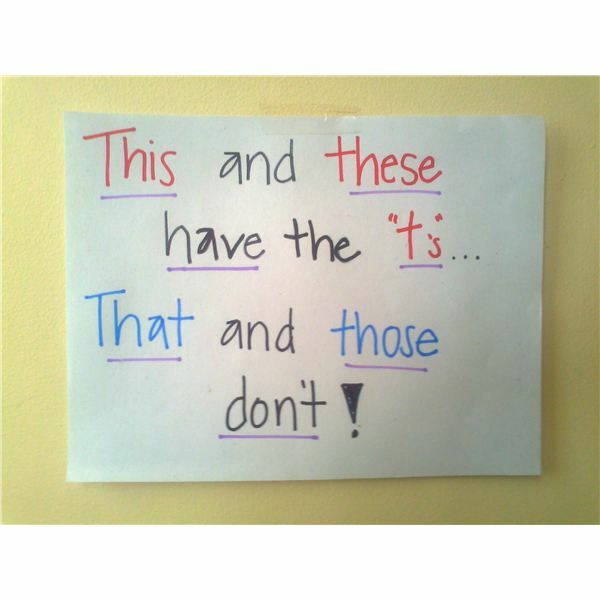 “This" and “these" have the “t’s"- “that" and “those" don’t. So when referring to “this" and “these" you will use este, estos, esta, and estas. When referring to “that" and “those" you will use ese, eso, esa, esas, and esos. Write down the jingle on note sheet. 5. Create examples on the board where students must come up and fill in the blank using the correct adjective and have students write those examples onto their organization page. 6. Permit students to work with the student next to them and come up with a list of objects around them while describing the proximity or distance with the adjectives. Have them share with the class. This topic will be one that may need to be stretched over several days because it may be difficult for students to grasp. As students create their lists with partners, walk around the class to check for comprehension. Collect the list to check for gender and number agreement.